PART 1: Lamb shoulder - You can have this done the day before. 1 orange -half, squeeze orange juice in and leave both halves in pot. Turn oven onto 150C. In a large heavy based pot with a lid, put all the ingredients in. Start with putting in the lamb and follow with the rest. Put into the oven with the lid on for 4 hours. Turn oven off and leave in oven to cool. PART 2: Tahini Dressing - You can make this up to a week in advance. 2 tablespoons of tahini paste - needs to be fresh tahini paste, which means it is blended with the oil and more of a liquid texture. 1 teaspoons of honey Add a bit more if you need it sweeter. 1 teaspoon of garlic crushed. Put all the ingredients into a bowl and mix to combine. Or put ingredients into a glass jar, put lid on and shake. taste and adjust with either the vinegar or the honey. This can be done a week before and left in the fridge. Take it out the morning of when you will use it so it can come to room temperature. PART 3: Combining lamb, dressing and salad - At the last minute. 400 - 500g mesclun lettuce. Put the salad together with a layer of mesclun lettuce, shredded lamb shoulder, dollop with a teaspoon of tahini dressing, then repeat the lettuce, lamb and tahini once more. 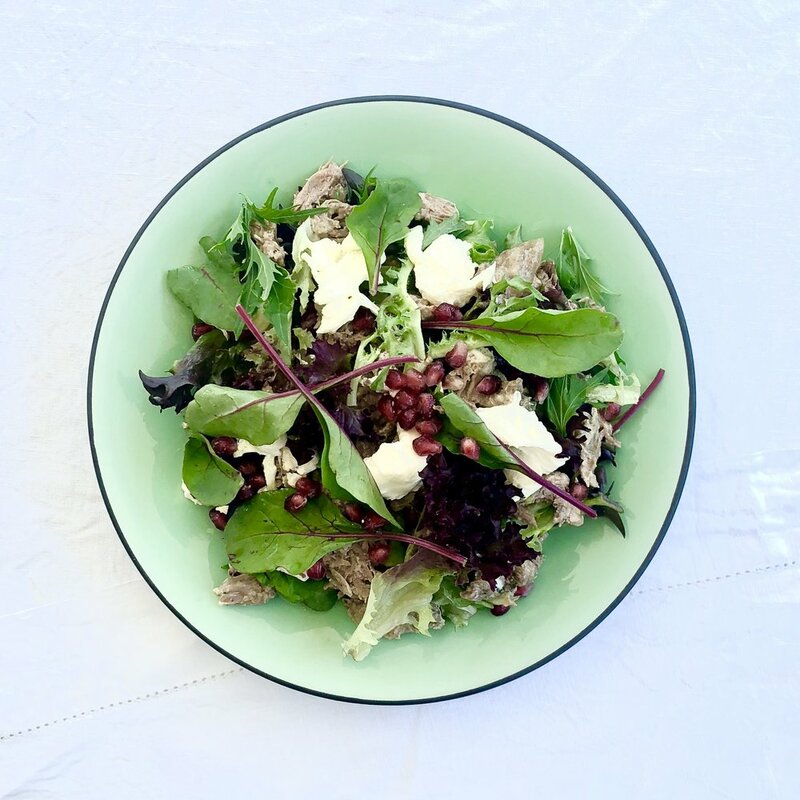 Top salad with torn bocconcini and pomegranate seeds. Drizzle 2 tablespoons of olive oil, salt and pepper. Serve straight away. Roll the fruit first to loosen the seeds. Score around the middle and tear it open into halves. Hold each half over a bowl, seeds facing down and tap the skin with a wooden spoon, squeezing a little to release the seeds.